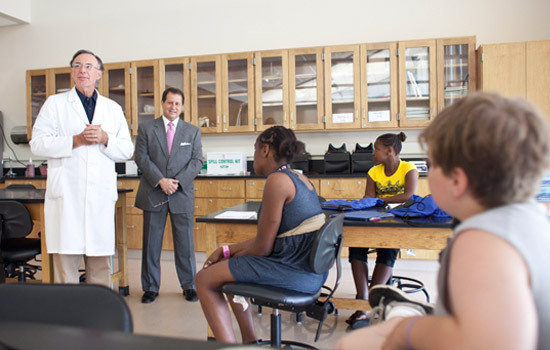 Doug Merrill, left, director of the Center for Bioscience Education and Technology at RIT, and New York State Assemblyman Joe Morelle, visit a group of middle school students attending a bioscience camp at the center. The science “bug” can be catchy, especially if the conditions are right: an enthusiastic instructor, hands-on experiments and science made real. This summer, weekly bioscience camps at the Center for Bioscience Education and Technology have attracted nearly 85 middle and high school students, some of them budding scientists—others, simply curious. The final camp wraps up this week—an expedition into the world of DNA led by instructor Chris Widmaier. He is using genetic research conducted at RIT as an entry into the worlds of biotechnology and bioinformatics, the blend of biology and computer science that made the human genome project possible. Twelve campers in this session are learning about the genetic code by inserting jellyfish genes into E. coli bacteria, causing them to glow under ultraviolet light. Since July, campers attending the various sessions have delved into evolution using RIT’s fossil collection, experimented with different fruit to determine the role proteins and enzymes play in making gelatin, and adopted the scientific method for studying energy and the earth, and living things. Medical Science camps, specifically designed for high school students, focused on human diseases as well as on clinical and research careers. Last week, New York State Assemblyman Joe Morelle visited the center and met with the bioscience campers. Morelle was influential in obtaining state funding to build the center in 2005. “Assemblyman Morelle enjoys stopping by now and then to meet with students and faculty and to learn about the center’s community outreach activities,” Merrill says. In addition to state funding, a $2 million gift from Excellus BlueCross and BlueShield helps support the center’s cutting-edge laboratories and provides scholarships for underprivileged children from urban schools to attend the summer camps. The center will follow its camp offerings with a series of professional development workshops for 40 middle school science teachers from the Rochester City School District. For the next three years, city teachers will be exposed to some of the latest trends in science and work together with the center to develop innovative strategies for teaching science to their students.